If you require hospitalization after a surgical procedure, you will be transferred to our medical/surgical unit to recover until you are discharged. Arthroscopy is a surgical technique used by orthopedic surgeons in which the internal structures of joints are examined for diagnosis and/or treatment. It involves the use of a tube-like viewing instrument called an arthroscope that contains optical fibers and lenses. During an arthroscopic procedure, the arthroscope is inserted into the joint through tiny incisions in the skin. The video images captured by the arthroscope are seen on a television monitor in the operating room. Arthroscopy can be helpful in the diagnosis and treatment of many types of arthritis as well as various injuries within the joint. A laparoscopy is a surgical technique performed in the abdomen or pelvis using a long, thin telescope-like instrument (the laparoscope) that transmits video images of intestinal organs to a monitor in the operating room. Only a very small incision is required for laparoscopic surgery, and surgeons perform entire operations using this advanced procedure. Robotic-assisted surgery has been available at Wooster Community Hospital since 2012. During this type of procedure, surgeons use robotic assistance to operate miniaturized surgical instruments that enter the patient’s body through tiny incisions in the skin. These instruments can mimic the motion of a human hand, while taking up much less space and offering better maneuverability. This innovative, minimally invasive approach offers patients numerous advantages over traditional open surgery. Ask your surgeon if your procedure can be done with robotic-assisted surgery. 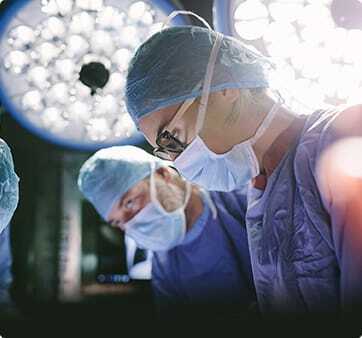 If you need surgery, WCH Surgical Associates, part of the Wooster Community Hospital Health System, provides excellent quality care for all your general and vascular surgical needs. Wooster Plastic and Reconstructive Surgery, also an affiliated provider of the Wooster Community Hospital Health System, specializes in cosmetic and reconstructive services to help you look, function, and feel your best. If you’re having a surgery at Wooster Community Hospital, you’ve probably got some questions. We’ve collected a few of the most common ones here to help you get prepared. Prior to your surgery, talk with your surgeon so that you fully understand your surgical procedure. Feel free to ask questions that are important to you to relieve any concerns you may have. Your doctor will schedule a time for your surgery and usually schedule pre-admission testing. The doctor will give you a pre-admission testing (PAT) packet that includes orders relating to your surgical procedure. Bring your PAT packet, a list of medications, allergies, and previous surgeries with you at the time of your visit. Once you are in the recovery room or your hospital room, your family members or loved ones can rejoin you. The nurses will check your blood pressure, pulse, respiration, and temperature from time to time. Before you leave the hospital, a nurse will review your discharge instructions with you. Again, please feel free to any questions you may have. Following discharge from Wooster Community Hospital, contact your doctor if you have any concerns. Where does my family member wait during the surgery? While you’re having surgery, your family members or loved ones may wait in the surgical waiting lounge. They will be notified when it is time to talk with the surgeon after the surgery. Pagers are available to your family members and loved ones in case they need to leave the waiting area during your surgery. For more information about the surgery options available at Wooster Community Hospital, call (330) 287-2595.